I hope you all had a great weekend! I was able to enjoy the beautiful weather and relax, maybe too much, because I finally finished my taxes. I've been procrastinating it until the beginning of this month, and it was not fun going through all the receipts and calculating inventory. I spent many many hours crunching numbers in Excel and setting up spreadsheets for the next year's taxes. Oh yeah, I'm totally ready for the next one. The board was starting to look too cluttered, and my desk was getting messy with random notes I jotted down on small pieces of paper. Apparently, I take that after my dad. I recently found this out from my mom. She said it drives her nuts that he leaves pieces of paper everywhere. Heh. Pretty borders on the flaps with edge punches from Martha Stewart + printed labels. Love it. I'm thoroughly enjoying these and also finding them very useful. What I great idea! I also have little notes everywhere, maybe I should try this too! Gorgeous! I am a note hoarder too and I love your solution. 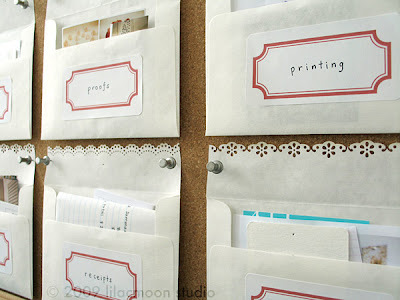 FABULOUS idea and so pretty! I'll be linking to this idea if you don't mind. I love the scalloped border, it's so pretty! @Grace: I got them as a gift couple years ago. Panasonic RP-HTX7, to be more specific. They should be easy to find.. Urban Outfitters has them online, too, here. The only complaint I have is that the upper band is off-white. I wish that matched the white ears. I still like them very much though. Hope that helps! I'm hyperventilating. I adore envelopes. love glassine/vellum envelopes. and I too write down things on paper scraps and then collect them (kind of). I love your idea and hadn't seen it done anywhere else. 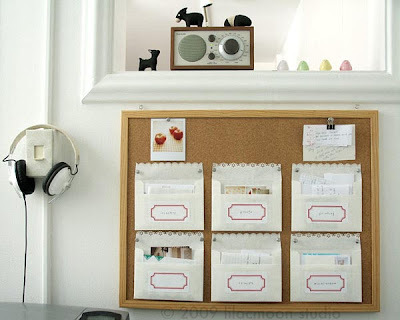 I have a board I'm doing nothing with and need something in my little office corner to organize paper. you provided the perfect solution! i've just found your pretty blog. wow, it is loaded with inspiration. such pretty polaroids too. xo. Thank you for such a great idea. I too will be linking to this if you don't mind. Sure, linking is fine but please do not use/reupload the image at your sites.. Thanks!